In addition to classroom instruction, the Library offers many online tutorials and research guides to help students develop information fluency skills. Feel free to link to them in your class materials or embed them in your Moodle courses. Librarians are also available to consult with students one-on-one. Please encourage students to make an appointment. Your friendly Cal Maritime Librarians have curated this collection of basic research videos by a variety of universities in the following areas. These short videos can be linked or embedded in your Moodle or Brightspace course. The Library creates custom research guides for specific subjects and courses. If you don't see a guide for your class or subject please request a new one. Students may schedule appointments with a librarian for in-depth assistance with all aspects of a research project, including topic development, using the Library's print and electronic resources, evaluating sources, and citation style. Students may use this service to discuss specific research difficulties or to find information for a topic or assignment. Click here to schedule an appointment with a librarian. Looking for an easy way to embed the library into your Moodle course? Add the Library block! Use the cross-arrow to move the block to where you want it. 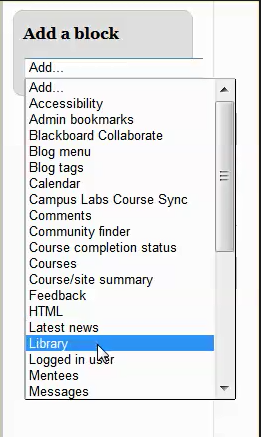 Access resources from the library in Brightspace using the Library Menu!